If you're a do-it-yourselfer, maybe you have created an awesome image that you want to send to people as an eCard. You could insert the file into an email and send it yourself, or you could upload your image and send it using an eCard delivery service, like CorpNote. Here's the pros and cons of sending it completely DIY, and some reasons why you may be ready to up your game! In our previous article, "How to Make an eCard - Birthday eCards, Anniversary Cards and more" we talked about how to design, compose and send an eCard using popular/free photo editing software and your existing email account. For person-to-person eCards, or cards sent to small groups, this works fine and there's no additional cost. But what if your needs are greater than what's possible just by using email? An eCard delivery service helps you create a customized eCard, manage lists of recipients and automate how and when your eCards are sent. Our eCard service, CorpNote.com, provides you with many tools and features that are designed to go beyond the capabilities of regular email, and are specifically designed for users that are sending eCards for ongoing business or marketing use. Here's a side-by-side comparison of the pros and cons of sending your "DIY eCards" via regular email, and the benefits of using CorpNote. Create and insert your own artwork Create and insert your own artwork or choose from hundreds of our designs, for many personal and business occasions. Compose message text in your email editor Compose message text with MS Word-like tools or use our Message Helper for ideas and sayings. Customize an email footer (required for business email campaigns) CorpNote lets you create a custom footer with your name, company, slogan, address & web address, company logo and social media links. Your footer is auto inserted into every eCard you create, and can be customized easily when needed. 'Unsubscribe' option – Giving recipients a choice to unsubscribe from your emails is a requirement for US businesses. If you send eCards DIY, you'll have to manage this manually. CorpNote inserts an unsubscribe link that automatically updates your contact list for you. You'll have to manually address your cards, using the 'To', 'CC', or 'BCC' fields in your email. Adding addresses is limited in email (max. 100 recipients in Outlook) and large lists may get blocked as SPAM. CorpNote has an online address book so you can send cards from anywhere. By creating 'groups' of contacts you can send up to 2,500 eCards at once. There's no big 'cc' list, and our eCards are optimized for reliable delivery. Using the 'To' or 'CC' field exposes everyone's email address. This information should always remain private. Everyone gets their own individual ecard – sent to them with your email address as the 'from' and 'reply to' address, so it is easy for them to follow up. Since individual emails are sent, there's no 'cc' list to expose others' addresses or possibly get blocked by junk filters. Everyone gets the same message, without personalization. With CorpNote, you can auto-insert the recipient's first name in the beginning of each card to personalize your message. With regular email you can click "send" right away or you can save a draft and manually send it later. 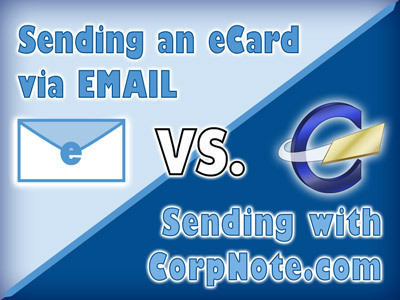 CorpNote gives you lots of options for how and when to send your eCards. You can take any new or saved eCard and click 'send now'; you can schedule a card to automatically be sent on any date in the future; or you can create recurring cards that automatically send year after year for occasions like birthdays and anniversaries, holidays, monthly announcements or other scheduled dates that meet the needs of your email campaigns. With most email there is no way to see who has viewed your message. Every eCard sent is tracked, and you can see when your cards are viewed, by whom and how often they viewed them. By knowing the success rate of your eCard delivery, you can easily follow up to ensure that the most people possible see your message. For many people, successfully sending their eCard is the end of the journey. While a great Season's Greetings eCard message MAY mark the end of an awesome year, we prefer to think beyond that single point of contact. If you are running a business (and most of CorpNote's customers are), every time you communicate, you are building your company brand and developing customer or employee relationships. That's why we provide lots of ways to easily CONTINUE the conversation with your eCard recipients! Here are a few examples of how we can make your eCard campaigns more effective, while also being more time efficient. If you've sent an eCard via email, your recipients can get back to you by clicking 'reply'. If you've sent a CorpNote eCard, your recipients can also get back to you by clicking 'reply'. With regular email you never really know who has received and seen your eCard. If your message is important, then there's no graceful way to follow up. CorpNote provides real-time stats on who sees your eCard, when they read it and how often they opened it. If you want to follow up, it's just a few clicks to send a new message to everyone that's viewed the card, a duplicate only to those who have not viewed it or a completely new eCard to the same group at a later date. If you want to do a similar eCard in the future, you'll need to make sure you can find a saved copy of the card you sent and modify it. CorpNote lets you save eCards as templates for fast access in the future. You can have as many templates as you like, all saved in your online account and quickly available for future occasions. With email, the time you've spent creating and sending an eCard is pretty much spent once the card is sent. CorpNote lets you leverage the usefulness of each eCard you've sent by providing you with a direct link where the final card can be viewed online. This link can be posted on your website for even more exposure – reaching people that aren't even on your email list. You can also post your eCard link on your social media, shared directly with individuals, posted to groups or displayed on your company's social media landing pages. Making and sending cards DIY or using free eCard services may be cost-free, but CorpNote's advertising-free eCards, tools and professional delivery have saved time and money for thousands of customers since we started doing this in 2004. We're firm believers that eCards are a memorable, cost-effective way to communicate with friends, colleagues and clients. The tools in CorpNote let you do this easily, with professional results. Our eCard delivery system is also completely integrated with our online RSVP invitations and online surveys. You can manage events, get answers to the questions that are most important to you, and make the most of your email contact list using a single online tool that works in the office, at home or on the go! We hope you'll give CorpNote a try for your next eCard campaign, event or online survey needs!